Two studies from Australia associate snoring in the first year of life to impaired cognitive development. Researchers suggest that lower cognitive development could become worse in these infants with age. 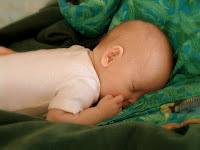 In the first study, 16 infants who started snoring shortly after birth were compared with 88 babies who did not snore. Infants were determined to be snorers if their snoring occurred three or more nights a week. Snoring because of a cold did not count. The results found that cognitive development was reduced in frequent snorers from the first month of life to six months. The second study looked at 13 infants who snored frequently from the first month of birth to 12 months. These babies had significantly lower cognitive scores when compared with 78 infants who did not snore frequently. Both studies were conducted through the University of Adelaide and University of Australia in South Australia. The research was published in the December edition of the journal Sleep Medicine. Learn the facts about young children and sleep and about snoring. Additional stories about children and snoring are available on the Sleep Education blog.